Updated Monday September 19, 2016 by AUBL Miami. 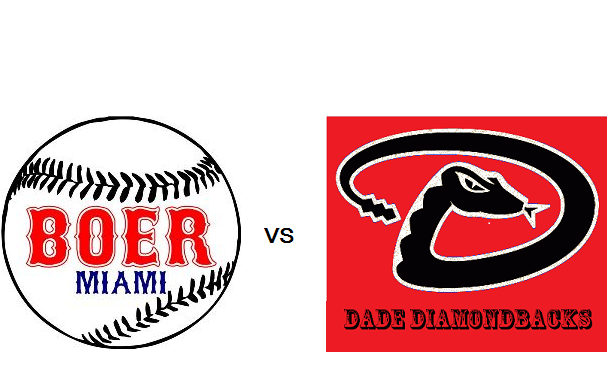 Boer Miami vs Dade Diamondbacks this Sunday 9/25/16 at 5:30 pm live from Flamingo Park in Miami Beach!! This special event will be broadcasted on the AUBL Miami Baseball Network. Commentators will be Christopher Femino and Henry Stevens. This game is a rematch of last season's championship series!! Both teams are currently in 1st place in their division. Both teams feature excellent pitching, hitting and defense. The winner of this game will earn a 1st round bye in the playoffs.